The Australian Music Centre, in collaboration with SOUNZ, the Centre for New Zealand Music, established the Trans-Tasman composer exchange residency in 2003 to further develop music relationships between the two countries. The residency exchanges offers significant opportunities for composers and sound artists to spend between six weeks and two months with a leading professional performing ensemble. The collaboration enables artists to develop a new work and participate in seminars, workshops and other activities, giving them vital experience and exposure as musicians. Michael Norris (Wellington) and Ensemble Offspring (Sydney) were working together from November 2010, to plan and realise a new work commissioned as part of the residency. The residency culminated in a premiere at the Sydney Opera House in March 2012. Video from the premiere by Ensemble Offspring of Michael Norris's Save Yourself. Michael Norris is a Wellington-based composer who holds composition degrees from Victoria University of Wellington and City University, London. He has held the positions of Composer-in-Residence with the Southern Sinfonia and the Mozart Fellowship, and currently lectures in composition at the New Zealand School of Music. In 2003, Michael won the Douglas Lilburn Prize, a nationwide competition for orchestral composers. With over 15 years experience, Sydney-based Ensemble Offspring has a reputation for adventurous programs that embrace unique repertoire and composers from Australia and abroad. Artistic Directors Damien Ricketson (composer) and Claire Edwardes (percussionist) lead an impressive line-up of versatile musicians whose wide ranging talents combine as Ensemble Offspring. The group has an open-minded approach to music-making, resulting in shows that are striking sonic and visual experiences. Recently the group was featured in the Sydney Festival, and presented 'Sizzle': innovative and laid-back events in bowling clubs across Sydney. Ensemble Offspring is committed to a living classical music tradition combining classics of the 20th century with the music of tomorrow from Australia and abroad. The ensemble is comprised of many of Sydney's most talented musicians. Claire Edwardes (percussion) and James Cuddeford (violin) have careers as international soloists, others - such as Veronique Serret (violin) and Lamorna Nightingale (flute) - perform with orchestras such as the Australian Chamber Orchestra. Bree van Reyk (percussion) performs with percussion group Synergy as well as plays drum-kit in various rock bands, while Jason Noble and Diana Springford (clarinets) can be found in diverse situations ranging from performing with Indigenous choirs to lecturing in philosophy. When the musicians come together as Ensemble Offspring they are committed to exploring new ways of making music. > Find out more about Ensemble Offspring. 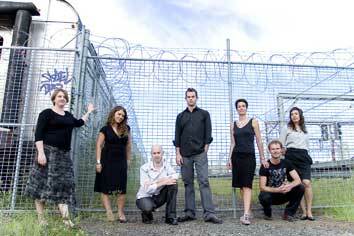 Applications for the Trans-Tasman Composer Exchange are not currently being sought. For all enquiries about this project, please contact the AMC's CEO John Davis .